One of these plaques is a very common Berkeley type: local architectural heritage enthusiasts have put up a marker celebrating what their plaque says was the long-time home of renowned architect Bernard Maybeck and his wife. The second plaque (see below) is unique: Neighbors created it to highlight their claim that the architectural group's marker is wrong in describing this as the Maybecks' longtime home. No matter who's right, I find it delightful. The texts follow. In 1901 architect Bernard Maybeck purchased ten acres of land here in La Loma Park. He built a sprawling brown shingle home for his family down the street in 1909 and subdivided the rest of his land into irregularly shaped lots. He sold these to friends and family and then designed their homes, many of which are still standing. After the 1923 Berkeley Fire, Maybeck and his wife Annie—one of the founders of Berkeley’s influential Hillside Club—built two small cottages on the site of their ruined home. In 1933 Maybeck built this more substantial house that epitomizes his domestic vision and artistic achievement. The Maybecks lived here until their deaths. Annie died in 1956, Bernard one year later. Plaque 2, which is within 20 feet of Plaque 1. Bernard built the house for his daughter, Kerna and he and Annie lived there with her for approximately one year. Annie and Bernard moved from 2780 Buena Vista Way 23 years before their deaths in 1956 & 1957. 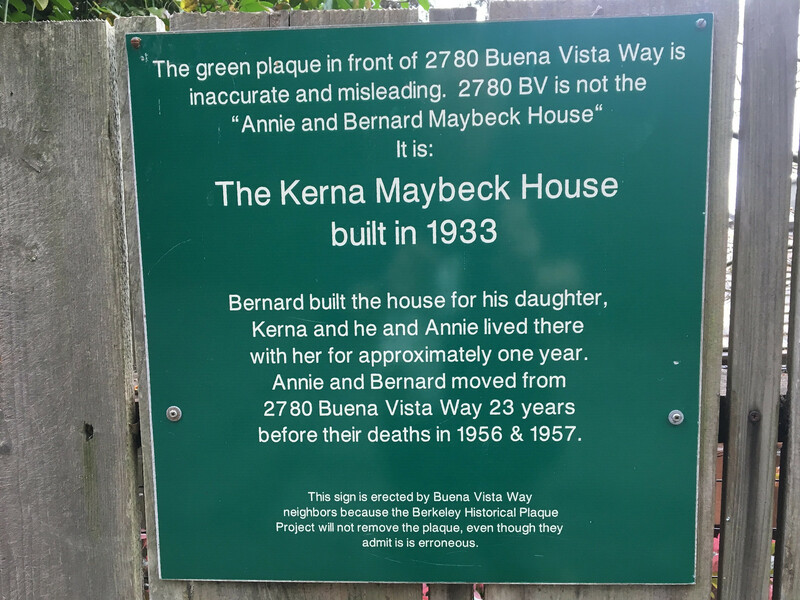 This sign is erected by Buena Vista Way neighbors because the Berkeley Historical Plaque Project will not remove the plaque, even though they admit it is erroneous. For what it's worth, the Berkeley Historical Plaque Project does concede -- in the online version of the plaque text -- that its marker is wrong. "The plaque that is installed contains erroneous information from the city's landmark application, the BHPP site says. If you're keeping score at home, this is all about where the Maybecks spent the last two decades of their lives. And that was on a property less than a hundred yards away, the Maybeck Cottage.